A family health insurance plan is basically a form of effective health insurance cover that provides coverage to you and your family against all medical emergencies in return of a single premium payment. With the same policy you and your family will get assured coverage. A family health insurance plan generally provides coverage to the entire family under a single plan. While you have the freedom to insure your parents, there are some plans also which allows you to insure your parents- in laws. This plan allows you to protect you entire family and allow you to live stress free. The family is the pillar of an individual's life. No matter how we suffer, but when it is about our family, we try our best to give our family complete protection against all the odds in the uncertain life. If one pillar gets attacked by some health problem, then your life is all upside down. That is why we want to be prepared to fight against the entire odd situation for the health of our family members. We all know that for the sake of our family, we can spend all our treasure of life and all our savings. But! After spending all that you have on your family how you will give them a better life and future? This is when one decides to buy a Family Health Insurance Policy. Buying individual covers for each and every member of the family need more money invested and you have to file the premium for everyone differently. But in family Health Insurance Policy you have to pay a less premium amount and it will save your money along with the safety of your family. You can even add some new member of the family like the newly wed spouse in the Family Health Insurance Policy very easily, just by informing the insurer. Family insurance will provide a vast umbrella that is enough to save and secure your family in the heavy rains. Why is Family Health Insurance Necessary? The growing pollution, faced paced life, consumption of toxic things, junk food is covering the entire country that results in unfortunate conditions such as, road accidents, contagious diseases, heart attacks and diabetes and that too in young age, and many more things may result in any kind of medical emergency. Have you ever thought of your future- Are you prepared enough? There is no doubt in saying that the growing inflation rate in the healthcare industry is causing a lot of issues and can easily wipe off your entire saving. And for sure, you don't want that for your family. Taking care of your loved ones - spouse, parents, and children is the top most priorities and cover their medical cost with the help of a family health insurance plan. Medical Insurance basically provide coverage against the hospitalization expenses related to your treatment. Under the same the person get the required coverage in the form of cashless benefits or the reimbursement. This plan is especially designed in a way that can offer the required coverage against critical diseases such as heart attack, stroke, kidney failure, etc. However, companies do not provide this as a family health plan, you have to buy it as an additional cover. It Provides a safety cover with the facility of life long renewability to the Policy holder. It even covers the Pre and posts hospitalization expenses of the client. This cover the dependent children of the family and the old people from age 3 months to 60 years under different policy plans and covers. It covers the hospitalization expense of the policyholder that cover the room expense, hospitalization fees, doctor consultation fees from age 3 months to 65 years. It a family coverage plan and it comes in three different variants to choose from such as Classic Plans, Supreme Plans, and the Elite Plans. The best part is, this plan provides a facility of double claim to the policy holder. That means if the policy holder has filed any claim in the other health insurance policy, even then he or she can file one more claim. A Family Health Insurance Policy covers all the members of the family against numerous disease and illness. The Family Health Insurance Policy is also called the Family Floater policy and in it, the fixed sum is insured which provide a cover for the complete family. The premium amount of the Family Health Insurance Policy is lower as compared to other insurance plans. Anyone who ages 18years to 65 years and resides in India can choose to buy a Family Health Insurance Policy. Family Health Insurance Policy covers up to 15 relationships, in general, that is to protect the complete family. One can compare and decide the best insurance plan for his or her family. In the age of technology no one has time for slow life and even in the terms of the Insurance Policy, no one can afford to visit door to door of the insurance providing companies as they are so many in number that it is not easy to check them online. PolicyX provides the customer an easy access to the world of insurance policies. One can sit back at home and check every information about the Family Health Insurance Policy with his or her family and choose the policy that suits them best. Any type of organ donation expenses for the policy holder is covered under the Family Health insurance Policy. Some insurance companies also cover some of the critical illnesses, but it is not necessary. For example - Tata AIG Wellsurance Family Insurance cover 11 critical diseases. A free look period of 15 days is offered to the policy holder from the date he or she get the receipt of the policy so that the client can take his or her time to review the terms and conditions of the policy one tend to buy. If the policy holder is having some doubts and there is a case of dissatisfaction, policy holder want to cancel the policy he or she buy then the insurance company will offer the refund of the premium amount that is paid. But no free look cancellation policy is applicable if the policy holder wants that at the time of renewal. As per the section 80D of Income Tax Act, the premium amount paid for the policy will be free of tax. 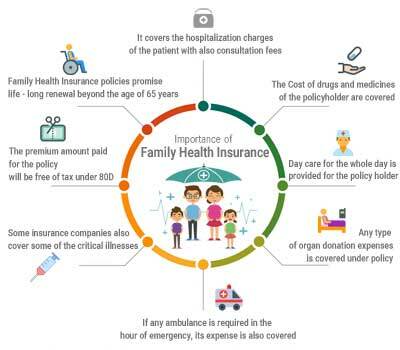 When it comes to family health insurance plan, the eldest member of the family become the policyholder and he/she should between the age group of 18 to 65 years. But there are a few insurers as well that offers the policy up to the age of 70 years and above. For Adults: The minimum entry age is 18 years and the maximum 65 years, while some insurers can to a person of 70 years and above. For Dependent Children: You can insure a baby of 90 (this may vary, some insurers may allow it from 30 days and some may have different entry age) to 25 years. Most of the insurance companies are providing the lifelong renewal option. You just need to renew the same on time to keep it active. After the due date of renewal the insurer provides a grace period of 30 days. If you want to keep the policy in force, you must renew before grace period ends or else the policy terminates. The Company is providing the online buying option through which you can save your time and hard earned money as well. With the online facility, you can buy the desired plan from the comfort of home and can clear your all queries as well. This option provides more ease and comfort to the clientele. It reduces the task of selecting the individual health plan for each member of the family and manage the same. It reduces the need of paying the separate premium of health insurance for each member of the family separately. Under the family floater plan, you can get discounts and incentives that plan usually offer. It is one of the easiest ways to secure the health of your family. In this medical plan, you can add a new family member easily. In case of the unfortunate death of the senior-most member of the family, other members can continue with the plan without losing any benefit. This is one of the biggest benefits of this plan. Some insurers allow customers to add siblings and in laws by paying a little extra cost. It comes with many helpful and attractive features such as coverage on maternity, new born baby, etc. As this is the world of inflation, income is increased due to industrialization, but with that everything is also getting expensive. And so is with the cost of medical treatment, it also increases and so is the number of diseases. So, the insurance providing companies increase and upgrade the facility that they offer to their customers but, along with that the amount of premium to be paid for the insurance policies. Even when you are in the routine of updating and renewing your insurance policy time and you have No Claim Bonus in your favor, few insurance companies provide the policy holder a bonus or reward by increasing his or her amount of the sum that is insured. So, one should be well aware of the terms and conditions and history of the company before he or she buy any insurance plan, so that he or she has a knowledge about any such benefit provided by their insurance company. Family Health Insurance Policy does not cover any type of health disease that is caused by excess intake of alcohol or drugs that are not prescribed by any doctor. Sexually Transmitted Diseases ( STDs) like AIDS or HIV are excluded from the Family Health Insurance Policy. Any treatment for complications in pregnancy like infertility, abortion or miscarriage or any treatment related to childbirth is not covered under any Family Health Insurance Policy. Non - allopathic treatments are not reimbursed or assisted under the Family Health Insurance Policy. Any assistance for the dental or oral treatment is not provided. Any reimburse for any loss or damage caused due to mental disorder is not entertained by Family Health Insurance Policy. No diagnostic fees will be reimbursed if the policyholder has no positive sign for the disease, but he or she wants to undergo the medical tests. Any harm or loss caused because of any suicidal attempt of the policyholder is strictly excluded from the Family Health Insurance Policy. What Is Covered Under A Family Health Insurance Plan? In-patient Hospitalization: All the medical expenses that take place because of hospitalization will be liable to get cover. If any of the insured family member is hospitalized for more than 24 hours, then the insurance company will pay all the medical expenses related to the same. Pre-hospitalization Expenses: The insurance company will also pay for the expenses that occur before hospitalization are termed as pre-hospitalization expenses. For example, X-ray, MRI, blood test, urine tests, sonography results, etc. done before hospitalization are covered. Post-hospitalization Expenses: Any medical expenses after getting discharge from the hospital would be liable to get cover.For example, medicines, or any medical tests done after the discharge to check the improvement. Ambulance Charges: Most of the insurance companies offering family health insurance plan covers emergency ambulance charges. The amount of the emergency ambulance charges varies from insurer to insurer. Hospital Cash: The insurer offers daily cash allowance. The same amount can be used for the purpose of transportation or other basic requirements of the person attending the patient. Restore Benefit: There are several health insurance companies that provides the restore benefit feature under family health insurance plan. It assist to reinstate the basic plan cover in case the coverage gets exhausted. Day care treatment: Day care treatments which do not require 24 hours of hospitalization. For example, medical expenses related to cataract which can be treated within few hours. Family Health Insurance Policy follows the same claim reimbursement process. But, you should not forget to check the terms and conditions of the claim process of the company they owe the health insurance policy. The Policyholder should understand the claim settlement process of the insurance policy and should check the settling of policy claim. The policyholder can choose a company that provides the facility of cashless hospitalization in which there is no need of any hustle bustle and load of any documentation and other formalities as one have to do in the policy claim settlement and reimbursement. But one should make sure that even if their facility of cashless hospitalization, policy holder should check that if the hospitals listed in the policy are reputed or not. So, there are many insurance policies in the market, but you and your family deserve the best. PolicyX will not only help you in comparison of policy, but you will get all information like discounts, benefits, claim reimbursements, new add-on information and attractive features of the website of PolicyX. Moreover, PolicyX will represent you to the insurance company in every aspect and will help you to project your questions and doubts on every step. This is a promise that you will enjoy a hassle-free assistance and customer support of the PolicyX team whenever you need it without any delay. You may come across a lot of portals which are offering comparison services. But at PolicyX.com, what you get is unbiased advice to take care of your health related needs. Our database is linked with leading health insurers, which allow us to offer accurate quotes and features to you on a real time basis. You can complete your policy purchase on our portal by using different payment options such as credit, debit card or net banking. Please keep in mind that few policies may require medical tests for certain age groups before purchase. Our team of dedicated telesales executives will help you in the same so that you can undergo medical tests at your nearest location and can make a payment online for policy issuance. PolicyX.com is IRDA approved portal and thus follows the norms of IRDA for accurate and trustworthy comparison service. PolicyX.com provides plan comparison from leading brands such as Religare Health, Max Bupa, Bharti Axa, Tata AI, Apollo Munich, Star Health, etc. Buy policies within minutes by filling up the online form. Most of our health plans are online and you can get your policy instantly by making an online payment. 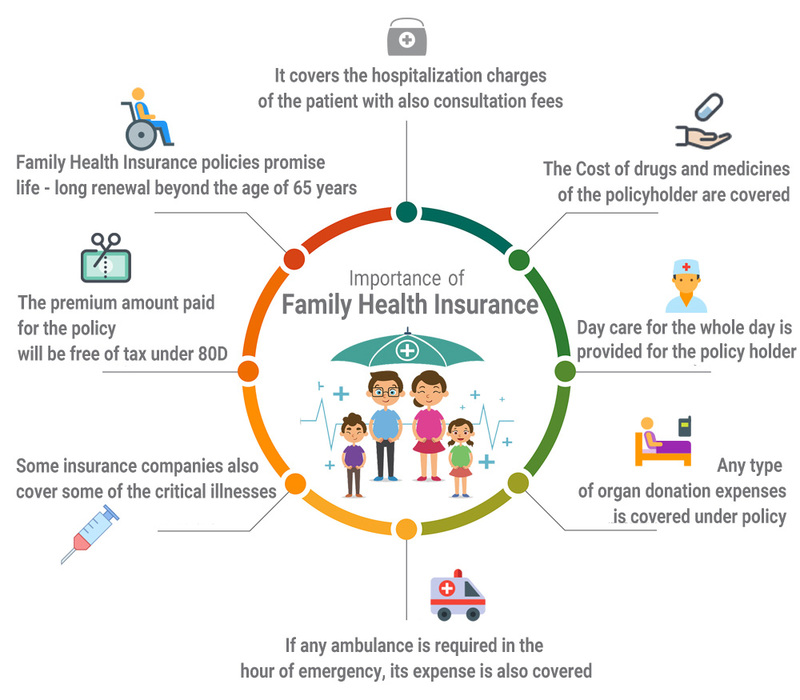 Almost all the expenses related to treatment or hospitalization are covered by the family mediclaim policy, but it is still vital to check the features of the plan and what it basically covers. You should check from when does the policy start covering the pre-existing diseases and check out the exclusions as well. Is There Any Waiting Period in a Family Health Insurance plan? An Initial Waiting Period: It basically refers to the waiting period of 30 days that may vary from insurer to insurer. Some also have it of 90 days instead of 30 days of the policy issuance. However, any medical expenses that occurs because of accident will be covered from day one. Specific Waiting Period: Almost every family health insurance plan offers a list of specified illnesses which would not be liable to get the coverage for initial 1 or 2 years of the policy which is popular by the name of waiting period. For example, arthritis, benign ear, nose, and throat disorders, cataract, hernia, kidney stone, etc. Pre-existing waiting period:If any of the insured family member have any pre-existing disease such as hypertension, diabetes, any heart ailments or any other ailment at the time of purchase of family health insurance plan is not covered for a specific time period. They will get the required cover after the waiting period. The pre-existing waiting period may vary from 1 year to 4 years depending on the insurer. But, in most of the cases, the period for pre-existing diseases under a family floater plan is 4 years. 1. How to buy new family health insurance? It is advisable to compare family health insurance online.For the same, you have to provide a few details of the family members that includes basic details, age and pre-existing disease, if any. Then you can compare plans on the basis of features, benefits, exclusions, bonus, etc. Once you finalize the plan, make the premium payment. After paying premium, you will receive digitally copy of your family health insurance policy. 2. How to renew family health insurance plan? You can simply login to the insurance company's website and fill in your family health insurance policy details, and pay the premium. Once the premium is paid, you will receive digitally copy of renewed family floater policy. 3. What should be the minimum age to get into the family health insurance? 4. Is it come out with lifetime renewal? Not really, but there are a few plans that can offer the option of lifelong renewability. No, family health insurance plan do not provide coverage for OPD treatment. 6. What are the basic benefits of Family health insurance plan? I have health insu. of United ins. Co.I want to change in another co .